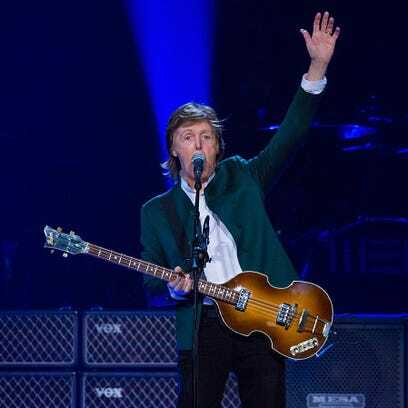 The world would probably forgive Paul McCartney for resting on his laurels at this point.But McCartney, it seems clear, wouldn’t be able to forgive himself. Working up a generous, three-hour, 39-song set Wednesday night for a capacity Joe Louis Arena crowd that included Michigan Gov. Rick Snyder, the pop-rock titan served a lesson in living up to one’s towering reputation.Detroit was a late stop in the 2½-year-old Out There tour, which has a final show in Buffalo on Thursday night before McCartney’s ever-chugging tour machine is expected to at last take on a new name.